For the first time maybe ever, I actually have a ton of outfit photos. By that, I mean that I have maybe three sets of photos that I haven't posted yet and that I'm actually ahead of the game. I can actually plan out posts rather than editing and resizing the night before posting them. So why then, with that being so, am I posting a set I just took yesterday (I'm writing this on Tuesday night)? It's this dress I tell you. It's from Ruche, and it's the perfect floral dress for spring. It's comfortable, cheerful, and those couple added ruffles are just the sweetest detail. I also really enjoy these photos that I took with Katie on probably the prettiest part of campus, which just happened to match my dress. Katie and I actually borrowed a couple of each other's clothes (one of those posts I have sitting in a draft), and you should definitely take a look at how she styled one of my cardigans. What am I going to do without friends who understand (and help me with) my need to constantly take pictures of my outfits? Who else will get my need to stop whatever I'm doing to Instagram a picture of my shoes? You can't find these kinds of friends just anywhere. Speaking of which, it's officially my last week in Illinois, and it's starting to hit hard. I did have a pretty fantastic weekend though. My friends at the paper and I had our end-of-semester pot luck and party, as we do every semester, and it was just a great night all around and probably the best party we've ever had. The following night a bunch of us watched "Pulp Fiction" together, which will forever be one of my all-time favorite movies. Sunday included lunch with some old friends, dinner at my brother's and playing with my nieces and nephew, and studying (mostly) with friends at a local coffee shop at night. For as much as my friends make fun of each other, it's pretty nice to see how much everyone is scrambling to spend as much time as possible together before graduation. Seriously, how am I supposed to leave? On an unrelated note, is there a surefire way to hate a bunch of people in a short amount of time? Or maybe some way to erase someone's memory? Asking for a friend. In my daily TV ramblings, I just wanted to mention quickly how Sunday night TV is insanely good right now and the amount of stellar programming currently on the air is almost ridiculous. "Game of Thrones," "Veep," "Silicon Valley," "Last Week Tonight" — HBO is just killing it right now — and "Mad Men" are all on Sundays, while "Orphan Black" airs on Saturdays, and "Louie" finally returned to Mondays. Don't ask me how I have time to watch all of these — I really don't — but if you aren't watching any of them, I suggest you change that. I love the ruffle detail on that dress! Friends like that are hard to come by, I constantly am having issues figuring out how I'm gonna get a new outfit post! Enjoy your time before graduation because it'll fly by! I also just got into Orphan Black and am obsessed! 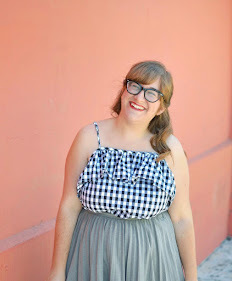 This dress is beautiful on you, Elana! You're making me SO nostalgic for the end of college. Also, I've heard Silicon Valley is really good. You want to hate me? I hate you. You look super cute and springy! I am about to start Game of Thrones!!! So excited! love love the floral dress!!!! Love your floral dress! So pretty and perfect for warm weather! You look so absolutely darling in this! This is such a pretty dress!! You look adorable and totally spring-y! I'm in love with this dress... it's so feminine! Don't you just love it when you have posts all lined up and just ready to go? Makes you feel satisfied. This look is super cute... love that little bitty ruffle. loooove this dress on you!! That floral dress is so perfect for spring! I'm loving the colors and flowiness of the fabric. So cute and perfect for the warmer temperatures to come. Also, thank you for the new TV show recommendations! My favorite besides Game of Thrones on Sundays, Revenge, is having its finale this weekend so I'll have to find some new shows to replace the gap. I have written down all of them to check out. I'll let you know if you got me hooked! Oh girl I know how you feel. It's such a mad feeling trying to sort through everything that is happening right now. I know you graduated this past weekend and congrats for that! I want to compliment this photo spot but if you'll never get to use it again, should I just keep that to myself? The dress is lovely too!